My fellow Papua New Guineans. Papua New Guinea is a place of great opportunity, that also carries with it great responsibility for us all. There is opportunity in the great wealth that has been given to us: · the resources deep beneath our homes; · the marine life in our waters; and, · the animals and plants that grow on our land. As a Government, we have a responsibility - to our people - to make the best use of these resources. This means developing better downstream processing for our exports so we add value. We will, for example, develop a petrochemical industry in our country; and, we will process more of our fish and agricultural exports in Papua New Guinea. By far though, our richest resource – is our people...... the men, women and children of Papua New Guinea. We were elected in 2012 – based on our commitments to improve the lives of people in our country. As a coalition we signed the Alotau Accord – agreeing that we would be a Government of reconciliation; a Government of unity and hope – for stability and prosperity. This was our “Platform for Action” and we have implemented 80 per cent of these commitments. Your Government has made a commitment to provide an education for all of our people. We will have the first full generation of educated Papua New Guineans thanks to free education. Your Government is investing in medical care so that we can keep your family living longer and healthier. We will continue to invest in improving law and order. There is no doubt that a lot more needs to be done in improving our police service. We have already reopened the Bomana training college and new police are now on our streets. A new police discipline structure will also be implemented in 2016 - which will come down hard on undisciplined officers. Then in March we will introduce legislation to target and combat ill-discipline by police men and women. We will have a ‘one strike and you are out’ policy. The people of our country have had enough of ill-discipline from police. We need to restore honour in our constabulary. We will continue to work to deliver the services of Government, and we will continue to make Papua New Guinea a better place. The eyes of the world will be upon us in the coming year and beyond as we host major events. Next year we will host the Africa, Caribbean and Pacific Leaders Meeting, and the FIFA Women’s under 20 World Cup. 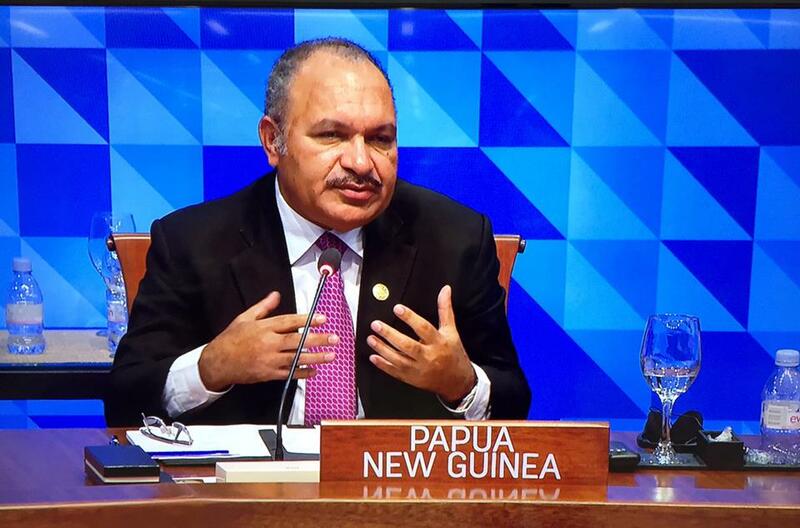 Then in 2018 Papua New Guinea will host leaders of the Asia-Pacific for the APEC Summit. Ours is truly a great nation – a nation of great opportunity. As a Government we take seriously the responsibility that you, the people, have bestowed upon us. Your Ministers and your Members of Parliament will continue to work day and night to advance our nation. Our Papua New Guinea is changing, it is changing for the better, and we are all in this together. May God Bless you and your family for a safe and successful year in 2016. Happy New Year Papua New Guinea.